(CNN) -- Williams have become the first of the 10 current Formula One teams to confirm their entry for the 2010 world championship. 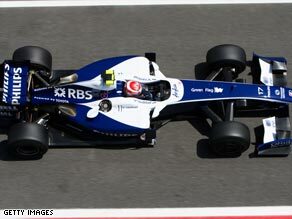 Williams have become the first of the current F1 teams to confirm their 2010 world championship entry. With the deadline for entries closing on Friday, Williams have been forced to act, making it clear their position in no way undermines the unified efforts of the Formula One Teams' Association in their ongoing debate with governing body FIA with regard to next year's proposed rule changes. On Sunday, the teams handed FIA chief Max Mosley a letter in Monaco demanding he scrap the 2010 rules, notably the budget cap and the prospect of a two-tier championship, in return for their commitment to the sport through to 2012. That was despite the fact Mosley had earlier claimed that progress was being made in the on-going dispute. Despite the continued furor, and with the clock ticking towards the deadline, Williams have had to step forward. "We can confirm we have submitted our entry for the 2010 Formula One world championship," confirmed Williams chief Adam Parr to Press Associations Sport. "We have done that, because we have a contract with Bernie Ecclestone's Formula One Management, and also with the FIA, called the Concorde Agreement. "We extended that for five years up until the end of 2012. Bernie has honored his obligations to us under that agreement. We have been paid in full for our participation. We feel morally and legally obliged to honor our side of that contract. "Secondly, we are a Formula One team. We don't do anything else. It is something we have been doing for 31 years. It is very important for our employees, sponsors and fans to know we will be in Formula One for next year and many years to come." Parr is eager to stress Williams have not broken ranks with FOTA, that the team remains fully committed to the organisation and their efforts to build a relationship with the FIA for a better F1. "We joined FOTA last year, and we're absolutely committed to FOTA," insisted Parr. "FOTA has done a tremendous job in many ways, such as reducing costs and helping Brawn GP get through their difficult times over the winter. "A lot of credit for that must go to (Ferrari president and FOTA chairman) Luca di Montezemolo, as well as the other teams for their support. "We want FOTA to continue their discussions with the FIA, who have made huge concessions, more than I thought possible. Max Mosley has been very conciliatory. But what we have here is a marriage. It's too important for everyone for that to break up." With Ferrari the leading team in taking the fight to the FIA, the next few days are crucial to the future of the sport. Parr added: "We have 10 teams all committed to Formula One. "But the FIA is right in saying it is both necessary and opportune to create the opportunity for a number of new teams to come into the sport. "In that context we cannot delay the entries. We are trying to be reasonable and find a sensible solution."